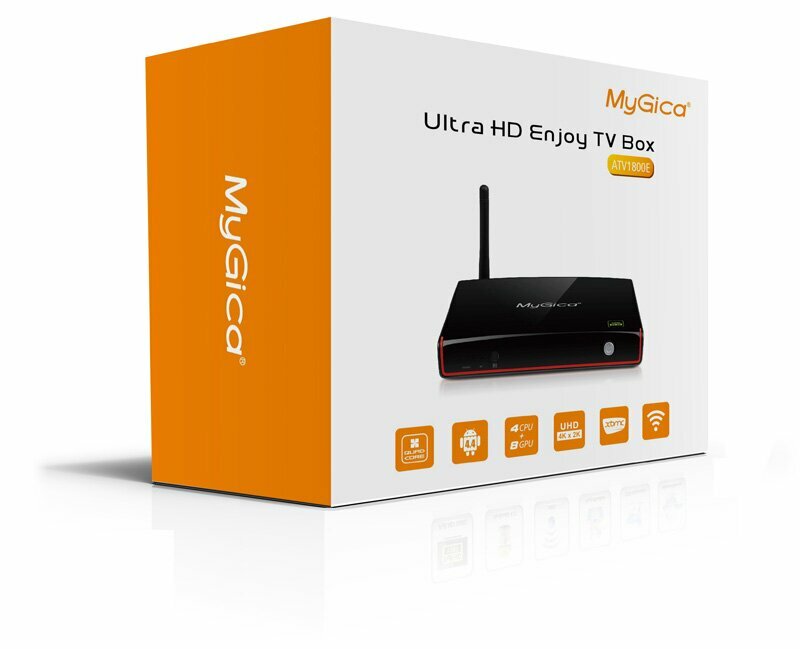 The highly anticipated MyGica ATV1800e is a real product and not an Internet Rumor. The world's first Quad Core CPU and Octa GPU Powered by Android 4.4 TV Box provides Unbelievable Life-like Ultra High Definition Clarity which is 4 times the resolution of Blu-Ray 1080P. MyGica ATV 1800e features the Super Speedy Amlogic S802B Quad Core Processor which supports hardware decoding of Dolby-Digital(AC3) through HDMI output. The ATV 1800e is light years ahead of the rest with 2.0GHz and Android 4.4 KitKat OS. Hardware decode any 4K Ultra HD (UHD 4K2k) video in seconds with Octa Core Mali-450 GPU and marvel at a crystal clear viewing in 3840x2160, 4 times the resolution of your standard 1080P HD. The internal memory of the ATV 1800e has been increased to 16GB NAND Flash and 2GB RAM. Along with that you get wireless 2.4 GHz 802.11 b/g/n network with external long range Wi-Fi antenna and Optional Bluetooth technology for the highest possible performance and better stability. To reveal the futuristic features of the ATV 1800e simply connect the Quad Core Powered by Android TV box with your existing Television. Plug it in the HDMI or RCA cable and instantly transform your Television into a Smart Powered by Android TV. Surf the net using WI-FI, use SNS apps to chat with your friends or just sit back and savor the latest on-line movies and music with your family. It's all here, neatly wrapped inside one little box. Android is the World's leading Mobile and Tablet Operating System. This means No Learning curves for Android users. The ATV 1800e is powered by Android which allows you to download applications on your MyGica ATV 1800e and share it with all your Android devices or vice versa. Download from Millions of Apps, Games, Books, Movies and more on the Google Playstore. MyGica ATV 1800e is preloaded with the Popular XBMC Media Center as its Premium Home Entertainment Software. XBMC has No trials, No Pro Edition and No Limitations. Our competitors seem to think offering a limited basic edition or trial period Media Center is acceptable.